Background: In modern chemistry, the asymmetric synthesis for the preparation of high purity chiral compounds to be used as pharmaceuticals or additives in foods have been of capital importance. Chiral auxiliary reagents are used to control the stereochemistry of the reaction in the generation of new chiral compounds, in this context, Ephedra compounds (ephedrines and pseudoephedrines) and some of their derivatives have been broadly used as chiral ligands in catalysis or chiral inductors in asymmetric synthesis. 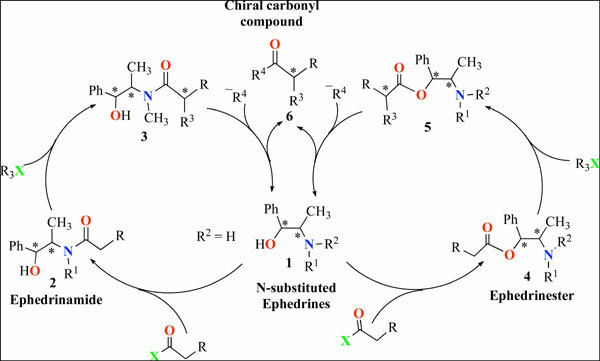 Objective: This review focuses on recent progress in the use of ephedra compounds and their N-substituted derivatives as chiral auxiliaries in the area of asymmetric synthesis, via the alkylation reaction of the enolates derived from their corresponding N-Acyl or O-Acyl derivatives, in the C-C bond formation. Conclusion: A vast amount of work has been done about the use of ephedra compounds in asymmetric synthesis area, in general, it was found that pseudoephedrines are much more effective than ephedrines and are preferred as chiral auxiliaries in the asymmetric alkylation of the corresponding N-acyl amides or O-Acyl esters. Alkylation with alkyl halides requires the use of more than 4 equivalents of LiCl to accelerate the alkylation rate and to complete the reaction without effecting the diastereoselectivity of the process. In contrast, the use of secondary alkyl halides was found to make the reaction very slow. Furthermore, a lot of work about the alkylation reaction in the opening of epoxides and aziridines, aldolic condensation, Manich reaction, addition of nucleophiles to α,β-unsaturated ephedrine amides and Michael additions have been demonstrated to be effective in the C-C bond formation. The aldol reaction of chiral enolates, proceeds with decreasing yields and enantioselectivities as the steric demand of the α-R of ephedrine amides and the size of carbonyl compound increase. In addition, the use of branched groups on N,N-disubstituted norephedrine esters is highly recommended in the aldol reactions of aromatic and aliphatic aldehydes.In the case of N-Acyl or O-Acyl ephedrines supported on polymers, the reaction proceed with good enantioselectivities but low yields, the enantioselectivities are goods but the yields are low. In general, the removal step of the auxiliary proceeds with low to high yields but without epimerization. Keywords: Ephedrines, N-acyl ephedrines, O-acyl ephedrines, alkylation reaction, asymmetric synthesis, enantioselectivity. Keywords:Ephedrines, N-acyl ephedrines, O-acyl ephedrines, alkylation reaction, asymmetric synthesis, enantioselectivity. Abstract:Background: In modern chemistry, the asymmetric synthesis for the preparation of high purity chiral compounds to be used as pharmaceuticals or additives in foods have been of capital importance. Chiral auxiliary reagents are used to control the stereochemistry of the reaction in the generation of new chiral compounds, in this context, Ephedra compounds (ephedrines and pseudoephedrines) and some of their derivatives have been broadly used as chiral ligands in catalysis or chiral inductors in asymmetric synthesis.